Large companies need to maintain a robust IT infrastructure if they want to thrive in the digital age, and they can’t accomplish this without certified IT professionals. Luckily, traditional schooling isn’t necessary to land an IT job; IT professionals simply need to pass their certification exams, and they can do so thanks to the wealth of training courses available. One such resource is this Ultimate IT Certification Training Bundle, which is currently on sale for $39. Aspiring IT professionals need to consider which providers they’d like to earn their certifications from. This bundle contains 11 courses from CompTIA, Microsoft, and Cisco, with the latter two focusing on vendor-specific technologies. 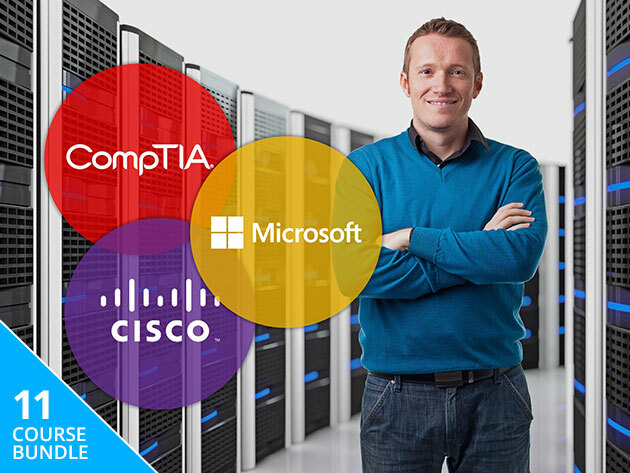 In this bundle, you’ll find beginner level courses for the Cisco CCENT exam, as well as material for advanced certifications such as CompTIA Cloud+. As we mentioned, a CCENT certification is intended for beginners. This bundle features a course on the ICND1 exam, a prerequisite for CCENT. This course covers basic topics such as how to install, configure, and troubleshoot small networks and how to implement Cisco routers and switches. Alternatively, CCENT can be skipped in favor of CCNA Routing and Switching, which requires passing both ICND1 and ICND2; this bundle also contains a prep course for ICND2. Those who have earned their CCNA will need to pursue a certification such as CompTIA Security to advance in their career. This bundle contains a course on the SY0-501 prerequisite exam, which covers network security and risk management principles. Once an IT professional has a solid understanding of network and security principles, they can look into advanced certifications to land a specialized role in project management. One such certification is CompTIA Project+, which trains readers on how to plan, execute, and close projects. Each course in the Ultimate IT Certification Training Bundle costs $299, for a total of $3,289. However, you can find it in the NetworkWorld Shop for $39, or 98% off.